Rescue efforts have been intensified after a second, more powerful earthquake hit southern Japan. An estimated 20,000 troops are now being deployed on the island of Kyushu after the 7.3 magnitude quake hit on Friday afternoon. They are being sent to help police and firefighters already at the scene. At least 15. Nine people died in the first tremor. The concern is that many people are trapped in collapsed buildings. At least 60 are feared to be under the debris of an old people’s home. Roads have been swept away by huge landslides across the region. 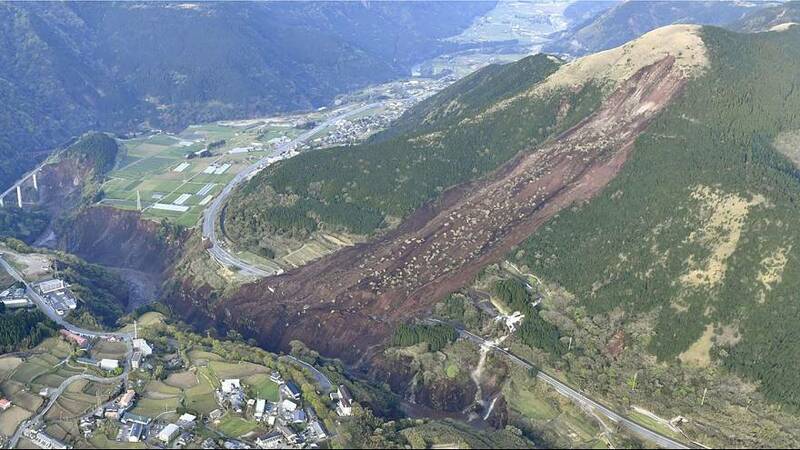 Public broadcaster NHK says residents have been evacuated from one village after a nearby dam collapsed. Around 200,000 homes are without power. 12,500 were left in the dark after the first quake. Thousands of people have spent the night huddled under blankets on the streets and in parks. So the second quake was much more severe than the first? It was much bigger and affected a wider area than the first tremor. Experts say it was at a much shallower depth and the faultline was longer. The ground would have moved by 4-5 metres. It came hours after the first tremor which registered at 6.5 on the Richter scale. It killed at least nine and caused widespread devastation. What about the island’s nuclear plant? Japan’s nuclear authority says there has been no damage to any of the nuclear facilities in the area. The memory of the earthquake and tsunami that led to a nuclear meltdown in Fukushima in 2011 is still fresh in everyone’s minds.